The most easily identified and most commonly found British tintype are the seaside portraits where families pose with buckets and spades in the sand or lounge in deck chairs on pebbled beaches with wrought iron piers in the background. Holidaymakers, possibly on their one grand day out per year, were able to have their photograph taken without even leaving their spot on the beach; an itinerant photographer would have pushed his cart along the sand looking for willing customers, without a need to entice sitters into a back street studio. In these seaside towns, photography was rapidly becoming a form of cheap entertainment. It could be consumed on impulse by those who might otherwise be tempted by a donkey ride, fairground attraction or other inexpensive amusement. What we would now consider a humble holiday snapshot was then a significant document of both a long-anticipated experience and possibly the first ever photographic portrait of that particular person. Furthermore it was made outside of the artificial and formulaic photographic studio and allows us, the present day onlooker, a view of a far more normalised and unconstructed environment. The seaside might also be the one place where middle class people could safely and easily have a tintype made – as a fun, spur-of-the-moment amusement in keeping with other beach entertainment. I recently saw a Victorian photo album filled with formal studio carte-de-visite portraits of a middle class individuals, but which also contained tintypes of groups of 5-8 people informally bunched together, as if on a relaxed family outing or community excursion. Apparently in these circumstances having a tintype portrait made was acceptable, as long as it was part of a larger social experience. 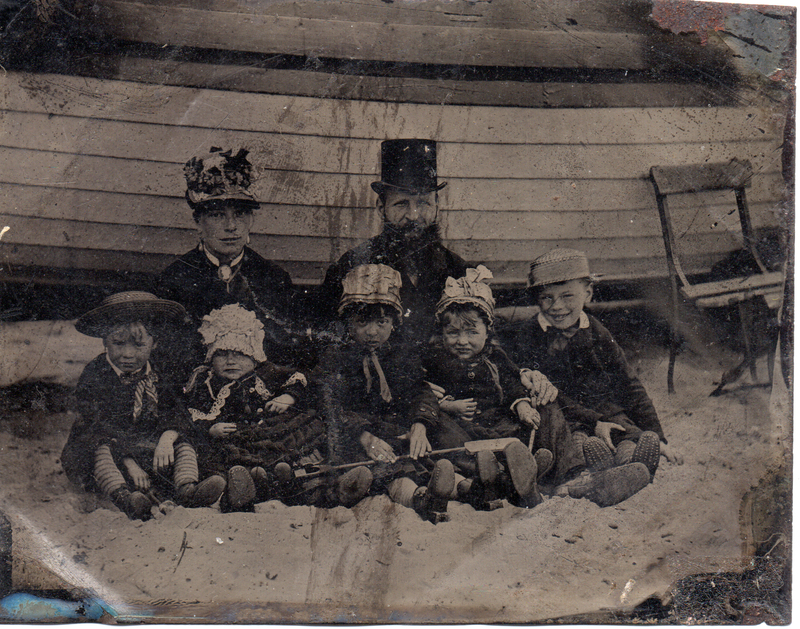 This image illustrates the incongruous outfits worn to the Victorian seaside compared with modern day beach attire: note the father’s top hat juxtaposed with the hobnail boots on all of the children. This entry was posted in Exhibition, Great Britain, History, Photo History, Photography, Tintypes, Victorian and tagged 19th Century, alt process, Britain, exhibitions, history, photo history, photographs, photography, tintypes, Victorian, wet collodion. Bookmark the permalink. Pingback: Beside the Seaside – "Your Dying Charlotte"